Storing chords and cables untangled or carrying those loose change in pockets/purses while traveling can be a pain, especially if you find them at the bottom of your bag. Almost everyone has sunglasses these days and many of us rather tuck them in our tops or just flip over on our heads, but don’t store them in the case. Don’t throw away those cases, but use them as compact cable. Just stick them in the glasses case and prevent all the tangling of cables. And if you’re carrying the empty case then store the loose change while on the road. It’s easy to access them from the box and doesn’t give away to the thieves. Use Altoids box for a perfect way to store small headphones and charging wires, or coins. The Altoids box can then be stored in the side of the camera bag. You may want to get a local SIM card while traveling to international destinations and if you own an iPhone then that tiny SIM-card opener pin is difficult to carry and can get lost easily. 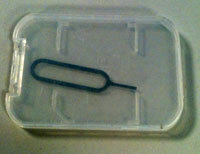 But if you have an unused SD-card case, then place the tray opener in the case and store the case in your camera bag. 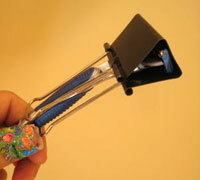 Wrap the razor blade with a binder clip to prevent it from cutting through other small items or just bend out. 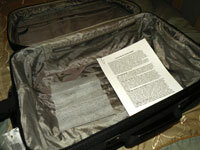 Simply add a dryer sheet int he suitcase, below all your clothes, to keep them smelling fresh. Save those used chapstick cases because they can be handy in storing small amounts of currency notes. This is a great way of carrying them around while traveling to not-so-safe destinations. Use a button to keep earrings together while traveling.